"I want to see you happy and fulfilled." IFC Films has debuted an official trailer for the indie drama Love After Love, which premiered at the Tribeca Film Festival last year and also played at the Edinburgh, Nantucket, and Palm Springs Film Festivals. 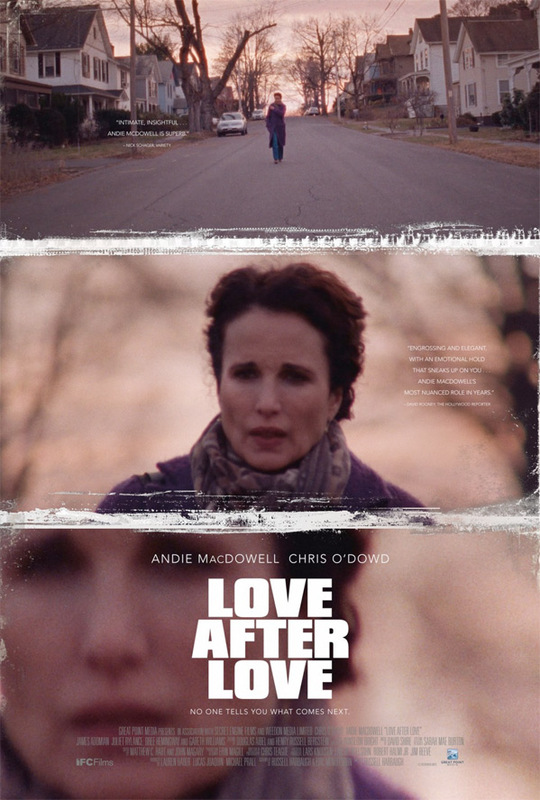 Love After Love is the feature directorial debut of Russell Harbaugh (who was nominated for an Indie Spirit Award for co-writing The Mend in 2016) and stars Andie MacDowell, Chris O'Dowd, and James Adomian. MacDowell plays a mother grieving over the death of her husband, trying to care for her two adult sons who are dealing with trials in their own lives while they watch their mother explore new beginnings of her own. Each discovers how hard it is to find love again after losing someone close. Also starring Francesca Faridany, Seth Barrish, Romy Byrne, and Andrew Beadle. This doesn't look as sad as it sounds, with some uplifting and funny moments worked in. What happens when you lose the foundation of your family? In the wake of a husband and father’s death, the family members he leaves behind find themselves adrift—and in danger of drifting apart—as they each try to find meaning in a world without the man who held them together. Mother Suzanne (MacDowell) tentatively seeks companionship—but her attempts at dating only drive a wedge between her and older son Nicholas (O'Dowd), whose own relationship with his girlfriend is disintegrating. Meanwhile, younger son Chris (Adomian) deals with grief in his own complicated—and increasingly worrying—way. What plays out between the trio is a beautifully observed, powerfully emotional journey that speaks to the strength of family ties. Love After Love is directed by American filmmaker Russell Harbaugh, making his feature directorial debut after a short film previously. The screenplay is written by Russell Harbaugh and Eric Mendelsohn. This first premiered at the Tribeca Film Festival last year, before playing at a few other fests. IFC opens Harbaugh's Love After Love in select theaters + on VOD starting March 30th this spring.